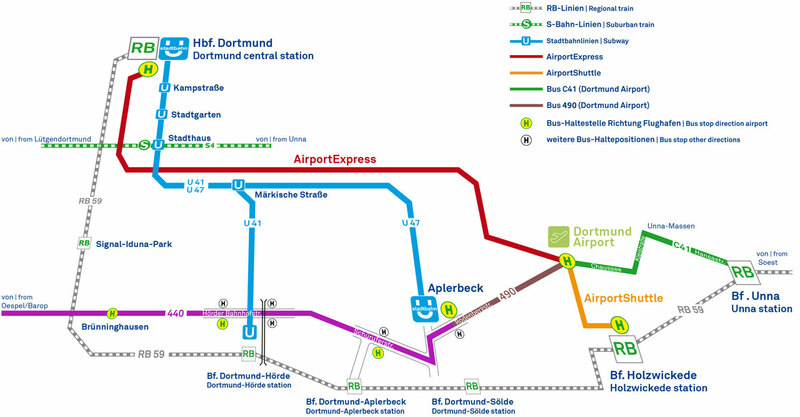 If you want to travel to and from the airport using public transport, you can take the AirportExpress which connects directly with Dortmund Central Station. If you choose to take the AirportShuttle, this takes you directly to Holzwickede station. You can travel to both stations on the Deutsche Bahn's local and intercity trains. If you are planning to purchase your ticket online, please refer to the Deutsche Bahn website www.bahn.com/en . This only pertains to public transport and excludes shuttle tickets which can be purchased on the bus. When you are planning your journey, please be aware that we recommend arriving at your airline's check-in desk between 1.5 or 2 hours before departure. This is to ensure that you will not miss your flight. Even if you have already checked in online, you should leave enough time for the security checks. You should be at the gate at least 40 minutes before your flight departs. The A40/B1 motorway will be extended - several full closures are planned in the course of the construction work this year. On these dates the AirportExpress detours and passengers should allow more time for their arrival and departure. The AirportExpress operates between Dortmund Central Station and the airport terminal during airport opening hours. The journey time is about 25 minutes (non-stop). The stop for the AirportExpress service is located directly on the Central Station forecourt (Königswall/City exit) near the taxi rank. The fare is €8.50 (€9.00 from 31.03.2019) for a single ticket. Children under 14 pay €2.00 and children under six travel free. Tickets are only available from the bus driver. The fare must be paid in cash and euros. You can travel between Holzwickede station and the Dortmund Airport terminal on the AirportShuttle. The journey time is about 6 minutes. The fare is €3.00 for a single ticket. Children under 14 pay €2.00 and children under six travel free. Tickets are only available from the bus driver. The fare must be paid in cash and euros. From 8/1/2017, the 440 bus will end in Dortmund-Aplerbeck. For travelling on to the Airport, please change to the 490 bus (from the Rodenbergstraße bus stop). If you are travelling to Dortmund Airport from the west of Dortmund (on the 440 bus or U47 tram, with change in Dortmund-Aplerbeck), you can take the 490 bus (from the Rodenbergstraße stop). The 490 bus also stops at the car parks (P6 East/West and P5) - the last stop is the Airport Terminal (departures level/level 1). For the journey from Unna station, you can take the VKU C41 bus which runs every hour. Dortmund Airport is included in the Deutsche Bahn Rail&Fly service. The tickets cover rail travel from any of the more than 5600 Deutsche Bahn railway stations to Dortmund Airport and back. You can book Rail&Fly tickets via Germanwings and many other airlines, travel agencies and tour operators. Note: With a Rail&Fly ticket, you can travel free of charge on the AirportShuttle to Holzwickede station (only).